Photo courtesy Reuters via BBC. 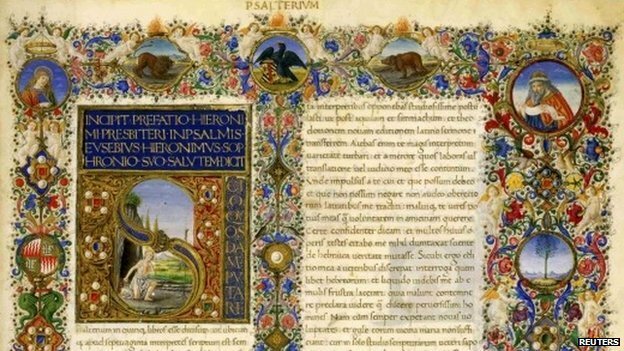 In a progressive move, the Vatican Library announced (3/22) its plans to digitize its collection of ancient handwritten manuscripts. The long-term goal of the project is to make 40 million pages of documents available online. Some of these texts contain important historical works in math, science, law and medicine. On the 22nd, President Jimmy Carter sat down with Diane Rehm of NPR to discuss his new book A Call to Action: Women, Religion, Violence and Power. In the interview, Carter discusses ongoing abuse of American women and our country's fight for human rights. Carter is 89 years old. Alice Munro was the first Canadian woman to win a Nobel prize in literature. On the 24th, the author was honored with a special coin inscribed with a passage from her short story Messenger. Strand magazine announced Tuesday (3/25) that it will feature a previously unpublished/ long lost short story written by Tennessee Williams titled “Crazy Night.” Read CNN's piece on the discovery here. Williams died in 1983. Editors at The American Scholar put together a list of what they claim may be the Ten Best Sentences (3/27). It's a good read – and it reminds me of this piece from last summer posted by The Atlantic, wherein some of today's most acclaimed writers list their favorite opening sentences. Jonathan Franzen lists Kafka, and other surprises.